A new twist on a classic design. This multi-tiered plant stand displays up to 7 plants. Creates an instant focal point or striking accent. Crafted of solid wood harvested from the Cypress tree family with decay resistance similar to Western Red Cedar. Moisture resistant for maximum weather protection. 7-Tier Plant Stand A new twist on a classic design. This multi-tiered plant stand displays up to 7 plants. Creates an instant focal point or striking accent. Crafted of solid wood harvested from the Cypress tree family with decay resistance similar to Western Red Cedar. Moisture resistant for maximum weather protection. 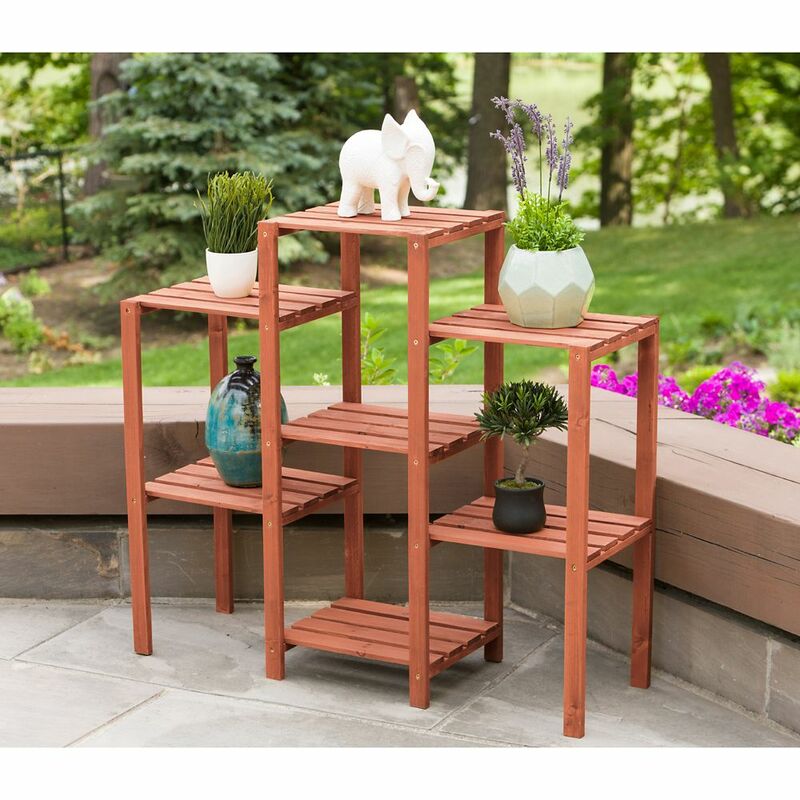 7-Tier Plant Stand is rated 4.3 out of 5 by 28. Rated 4 out of 5 by Murmaude from Good planr stand Have had it a few months now. Easy to assemble and cedar smelled lovely when unpacked although the odor is now gone. Light so easy to move but very sturdy. Using it indoors and plan to get one of the lower versions for my patio. If it were made of bamboo would give it a 5. Rated 5 out of 5 by Charlotte from Good product Very nice. Fits my plants and easy to put together. Rated 5 out of 5 by Angela from Worked out great for my needs.. the assembly was easy... Worked out great for my needs.. the assembly was easy enough and the stand is very sturdy. Here’s hoping it lasts. Rated 4 out of 5 by Anii from good for the price very nice, a little over priced and a little wobbly but perfect for small plants. Rated 5 out of 5 by Dennis from Just what I needed to display my outdoor plants. Very... Just what I needed to display my outdoor plants. Very easy to assemble. Rated 5 out of 5 by They Call Me Tim from Easy to assemble stand This stand was easy to put together. I like the wide slats as my old one they were only about an inch wide and this made it easy for the plants to get knocked over. This new one that won’t happen. What is the maximum weight each platform can hold? Each platform can hold approximately 3lbs.